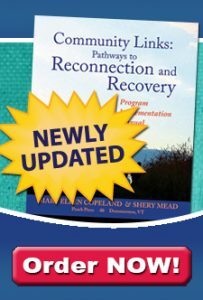 I had the pleasure of hearing you Mary Ellen Copeland speak at the Pittsburgh Recovery conference on September 11. I have never written to a speaker before, but felt so comfortable hearing you speak about your experiences that I thought I’d give it a try. I am an LCSW working as a supervisor for a rural mental health clinic. In my years as a therapist, I have shared my own mental health experiences in hopes of helping people see that they can achieve what others told them they could not. I was diagnosed with bipolar disorder in 1993 after years of failed marriages, alcohol, etc., etc., etc. You know the story. After my first hospitalization I decided to go back to school. I earned my BSW in 1996 and my MSW in 1998. I have had a total of four hospitalizations and have been on numerous medications. Thankfully, I have been stable for the last couple of years. It took a lot of hard work learning how to do the very things you were talking about at the conference. When I was able to believe in myself, my recovery began.